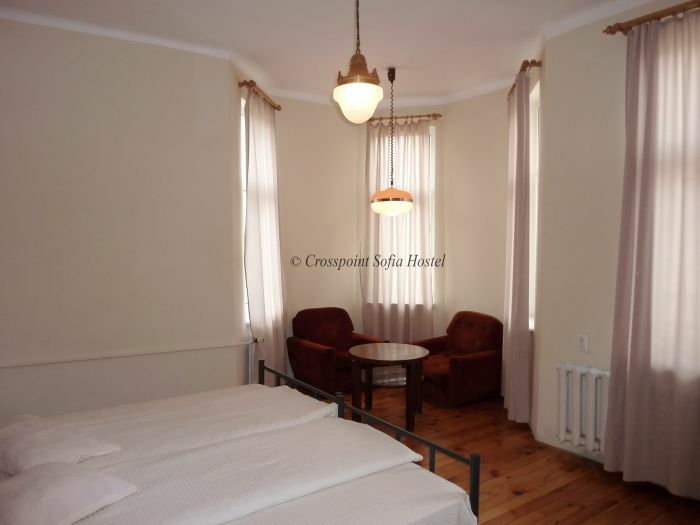 Quiet homelike rooms with large beds on top location - only 5min walk from all see sights of Sofia City Center, free city maps, free Wi-Fi, free kitchen, free lockers and more than friendly service. 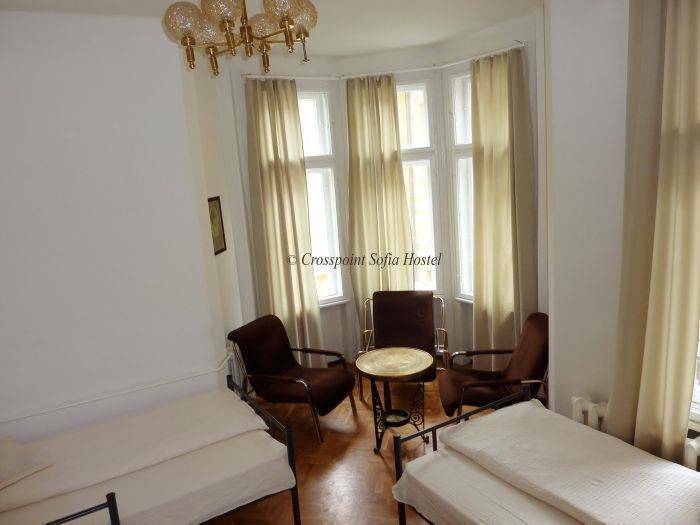 Set in a quiet street our beautiful old townhouse is only few minutes away from every interesting place in the Center of Sofia. We have the easiest connection to the Airport and the Central Bus and Railway Stations. (Check Location) We offer you 24/7 reception, plenty of FREE facilities (non-stop FREE Wi-Fi, FREE kitchen, FREE map of Sofia City Center, FREE lockers...) and more than friendly service. We have bright rooms with large and comfortable beds and a central heating in the winter. We welcome our guests in a large living room that has few sitting areas, a dining area, a fireplace, a piano, free Wi-Fi and internet access. At the reception we give free map of Sofia City Center to each of our guests with guidelines and directions to every monument, garden or building that’s worth seeing. We organize tours to the nearest attractions – the biggest monastery on the Balkan Peninsula – the Rila Monastery and more. We accept credit cards. We have full equipped kitchen available for FREE to each of our guests. There is a refrigerator, a stove with oven, a coffee machine and kitchenware. Our guest may use FREE iron and FREE hair dryer as well. We also offer washing and drying. 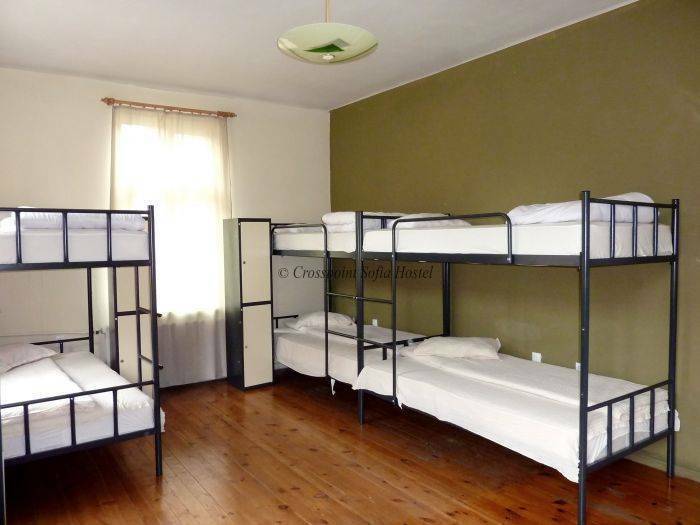 Our homelike rooms are with wooden floors and have sitting furniture. The beds are large and comfortable (1m wide). In the dormitory rooms there are lockers with personal keys, where our guests may safely keep their belongings. Now cultural monument the house was built at the end of 19th century and belonged to a medical doctor that served the Royal Family of Tsar Boris III and his sun Simeon II. The original fireplace, some wall decorations and some furniture are preserved and are available for the guests to admire. The high ceilings and the long windows make the chambers roomy and bright. 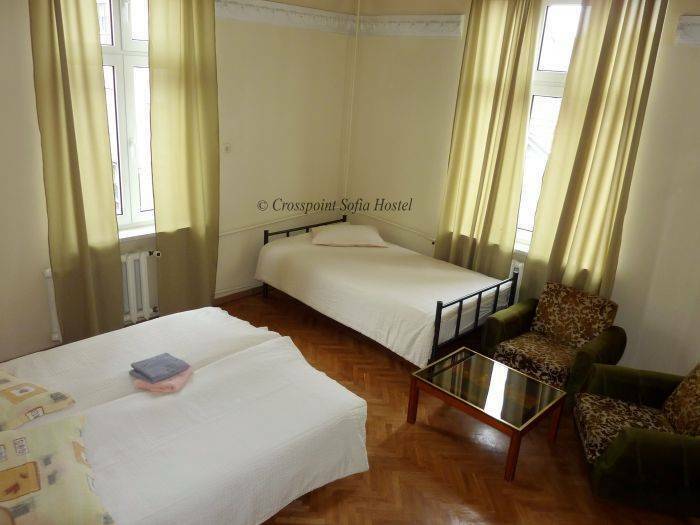 If you are looking for a quiet and home-like room located at the heart of Sofia City Center, our hostel is the place you’re searching for no matter if you’re traveling for business or pleasure. 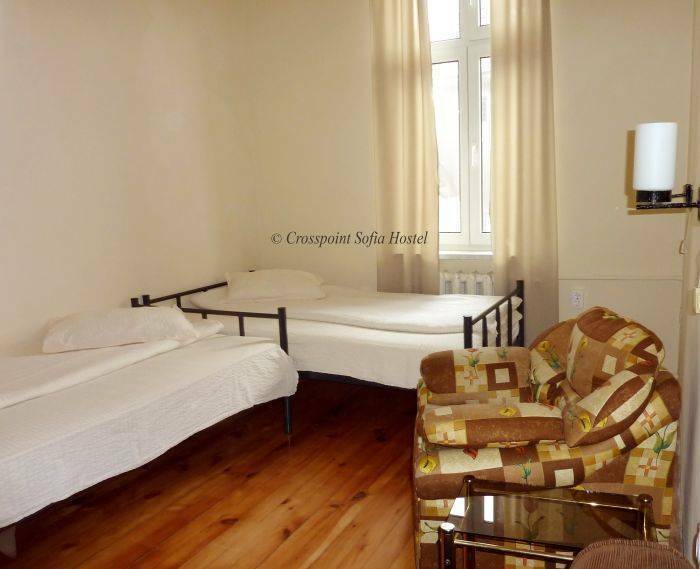 We welcome our guests in homelike rooms with wooden floors and sitting furniture. The beds are large and comfortable (1m wide). The high ceilings and the long windows make the chambers roomy and bright. In the dormitory rooms there are lockers with personal keys, where our guests may safely keep their belongings. Our common room has few sitting areas, a dining area, a fireplace and a piano. Children under age of 2 sleep for free with their parents. Please have in mind that for groups of more than 7 people or in need of more than 3 rooms we will accept cancelation no less than a week before arrival. 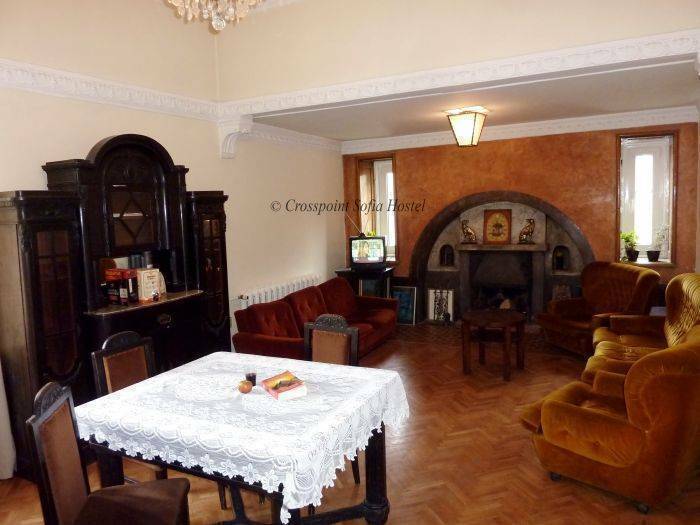 Our beautiful white three-floor high townhouse is located at the crossing of General Parensov and Malyovitsa Street. Please note: The entrance is from Malyovitsa Street. From Central Bus and Railway Station: Get tram N 12 direction Sofia Center, get down at “bul. Vasil Levski” station, than walk back the tram lines to the first crossing on the right. That is Malyovitsa St. You will see our white building on the right side on corner with Gen. Parensov St. Nearest airport: Get bus 84. Last stop in the Center is Gen. Gurko St. Walk two blocks along Vasil Levski Blvd direction Patriarch Evtimiy Blvd. Turn right on the second crossing - Gen. Parensov St. We are on the left side on corner of Malyovitsa St.